Rated G. On blu-ray 8/07. Ok for kids 5+. Let's take it back to 1964 for this delightful comedy starring Don Knotts as mild-mannered, bespectacled bookkeeper Henry Limpet. When the Navy rejects him due to poor eyesight, he falls into a funk and not even his beloved aquarium or bossy wife can rescue him. 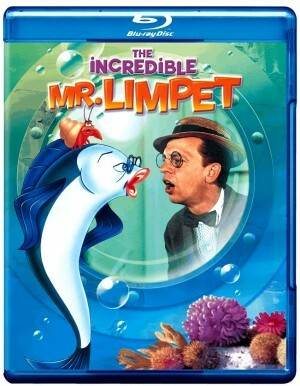 So Mr. Limpet makes a wish ... to become a fish. Next thing he knows, he IS a fish, but also a heroic patriot in his own loveable way, with help from a hermit crab named Crusty (voiced by Paul Frees) and a lovely Ladyfish (Elizabeth MacRae). Blending live action with undersea animation, this family classic is, indeed, incredible.